As the hardreading staff noted three weeks ago, both Boston Police Commissioner William Evans and Boston Mayor Marty Walsh rejected in no uncertain terms a WBZ-TV report that Evans was decamping for a job at Boston College. Evans also gave a full-throated denial to the Boston Herald. Regardless, it’s no surprise to see this story just posted on the Boston Globe’s website. 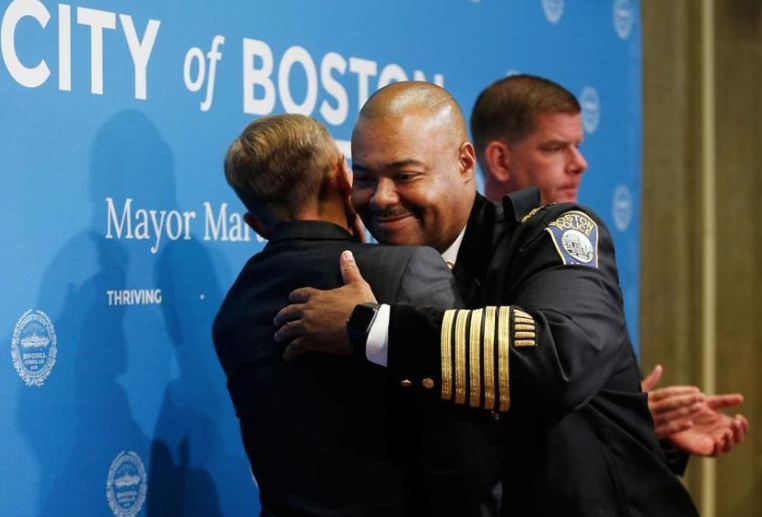 Boston Police Commissioner William B. Evans, an avid runner who ran in the 2013 Boston Marathon and then played a key role in pursuing the bombers who attacked the race, will retire, clearing the way for his second-in-command to become the city’s first African-American commissioner. Evans is stepping down to take over the public safety department at Boston College. He starts there on Aug. 6. His superintendent-in-chief, William G. Gross, will succeed Evans, becoming the first person of color ever to lead the department, which has 2,200 sworn officers. What is a surprise is that the Globe piece by John R. Ellement and Milton J. Valencia makes no reference to Evans’s earlier duplicity. Crosstown at the Herald, Jules Crittenden’s piece gives it an oblique nod but no link. Evans’ retirement and move to BC, rumored for weeks, was announced today at 10:30 a.m. at a press conference in the Eagle Room at City Hall, where Gross’ appointment as Mayor Martin J. Walsh’s permanent choice for the post was announced. We get it that no one wants to be the skunk at the garden party. But c’mon, guys – isn’t that sort of your job?